CHICAGO, Illinois, August 28, 2012 (ENS) – A jet fuel pipeline that ruptured Monday near Chicago has forced closure of Route 83 and part of the Calumet Sag Channel until Thursday. The burst pipeline spilled an estimated 42,000 gallons of jet fuel into a ditch that empties into the Calumet Sag Channel in Palos Heights, Illinois. West Shore Pipeline owns the pipeline and has secured the source of the spill. The Coast Guard is responding on scene with the U.S. Environmental Protection Agency, Illinois Environmental Protection Agency, and the Metropolitan Water Reclamation District of Chicago. The EPA is the lead agency for the response and has established an incident command post in the vicinity of the spill. 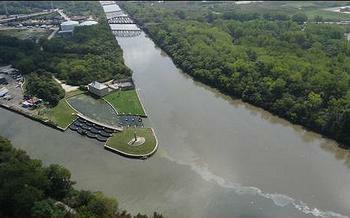 EPA officials estimate that the cleanup of the channel and surrounding areas could take up to three days to complete. In order to help facilitate clean-up operations, the Coast Guard has implemented a seven-mile safety zone on the Calumet Sag Channel that closes down the channel from mile marker 304 to mile marker 311.5. “The Coast Guard will continue to ensure the safety of responders and the public,” said Lt. Leslie Downing, senior investigating officer at Coast Guard Marine Safety Unit Chicago. “Our other objectives are to initiate any appropriate actions to control the source and minimize further release, assess the trajectory of the spill and identify any sensitive areas that need protecting, and keep the public informed,” Downing said. On-scene responders have deployed 600 feet of boom, a temporary barrier used to contain a spill, across the entire channel and around the source of the spill. The Calumet Sag Channel is a 16 mile-long navigation canal in southern Cook County that connects the Little Calumet River and the Chicago Sanitary and Ship Canal. The western 4.5 miles of the channel flow through the Palos Hills Forest Preserves, a large area of parkland operated by the Forest Preserve District of Cook County. The channel serves barge traffic in what was an active zone of heavy industry in the far southern neighborhoods of Chicago and adjacent suburbs. The channel is used by pleasure crafts in the summer time. Since 2006 it has also served as a conduit for wastewater from southern Cook County, including the Chicago-area Deep Tunnel Project, into the Illinois Waterway. Dozens of barges use the channel daily, and up to 14,500 vehicles drive on Route 83 every day. The cause of the pipeline rupture is unknown; the EPA is investigating.